I posted the first part of my new tutorial over the weekend. As part of that, I gussied up my calculator a bit – let’s see how it looks. Looks pretty good, I must say. Check it out below and let me know what you think. Of particular note in tonight’s game: Alex’s pronunciation of Cart-MAN from South Park. Kristin did a great job tonight – although I don’t like when Alex brings up streaks so early in a run. Will it jinx her? We’ll find out tomorrow at the earliest, because she’s got this in the bag. The fun stuff will come between Pauline and Darren. Kristin has her fourth win locked up; she can wager up to 4,600. A successful doubling will put Darren at 14,000. To cover this, Pauline should wager 4,200. 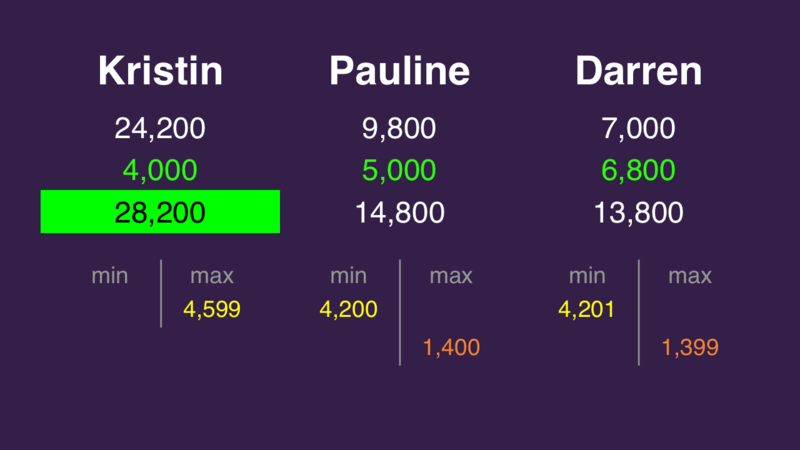 If Pauline is incorrect with that wager, Darren can wager up to 1,400 to stay above her total. We go into mind games for second place. Darren can wager at most 1,400. With a correct response, he’ll have 8,400. To stay above this, Pauline can wager at most 1,400. If she is correct, Pauline will have 11,200. To account for this, Darren will need to wager at least 4,200. No real reason to worry about these here; just add and subtract the $1 where necessary (although we don’t need to do this for Pauline, since she’ll win the tiebreaker for second). Both challengers correctly went “big”. One other note: as soon as the category was revealed, I reflexively shouted at the screen what turned out to be the correct response. 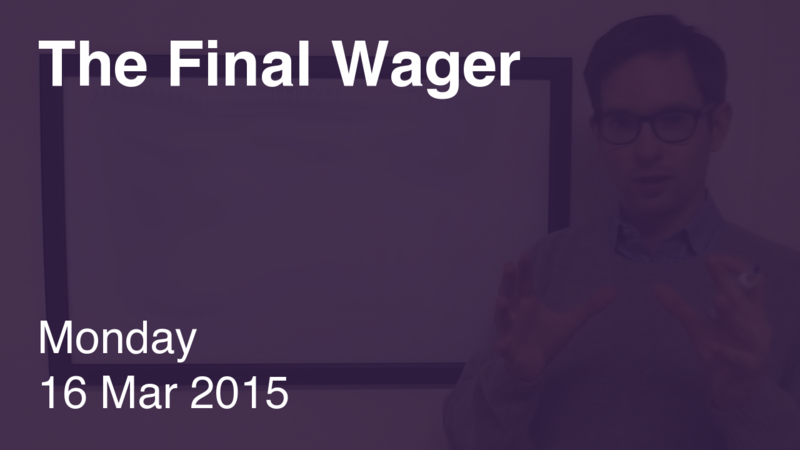 Love it when that happens.
.@TheFinalWager just wanted to keep the math simple. Ended up feeling lucky as it was since my kids were never really into that show.